Being low man on the totem pole isn’t always so bad. 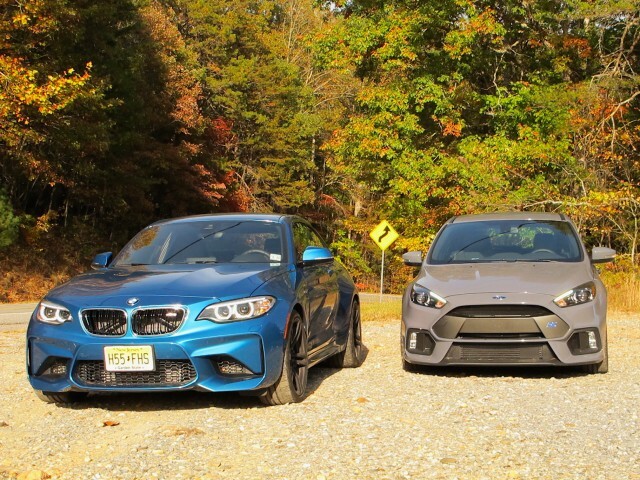 Two of our finalists for the Motor Authority Best Car To Buy 2017 award, the 2016 BMW M2 and 2016 Ford Focus RS, started life at or near the bottom of their respective lineups. The Ford Focus’ platform dates back to 2011. It’s a front-wheel-drive compact built mainly for economy buyers–though with its firm, responsive tuning, we’ve always liked the way the Focus handles. The BMW 2-Series is the German company’s entry-level product here. Its rear-wheel-drive layout gives it a stronger basis for a more sporty character, but it’s still the young gun. We drove these cars back to back last month during our Best Car To Buy testing, shooting north Georgia’s asphalt rapids, on roads that wind through hills and mountains, past drugstores that also sell guns, right by Expedition Bigfoot: The Sasquatch Museum. By the end of that uniquely American experience, we picked a winner. We’ll get there soon, but first, some details. Call it a mismatch if you want. One of these cars wears a luxury badge, the other comes from a mainstream automaker. There’s a bit of a price delta between the two. Our BMW featured only two options on top of its $51,700 base price. The Long Beach Blue Metallic paint added $550, and the Executive Package cost another $1,250. That package includes a heated steering wheel, a rearview camera, rear park assist, automatic high beams, and BMW’s Active Driving Assistant, which ties together features such as forward collision warnings, automatic emergency braking, and lane departure warnings. Add in the $995 delivery charge and the total comes to $54,495. The Focus RS starts at $35,900. Our test car came with the RS2 package, which adds an 8-way power driver’s seat, leather upholstery with synthetic suede inserts, heated front seats and steering wheel, and navigation. Add in the $875 destination charge, and the total comes to $39,560. It did not have the stickier the Michelin Sport Cup 2 tires on forged 19-inch wheels, which runs another $1,990. A car’s performance envelope starts with the structure on which it is based. A stiff, lightweight, well-balanced platform has a better chance of producing a car that is fun to drive, and the more premium that structure, the better. Rather than start with new structures, BMW and Ford went to the parts bin to turn the pedestrian Focus and the fun-but-modest 2-Series into full-on track toys packed with character. Of course, BMW and Ford took very different paths to get there, and Ford had to develop a few more parts than BMW did. Most of the M2’s components come from the M3/M4. The front and rear axles, with their lightweight aluminum suspension members, forged aluminum control arms, and carriers for the five-link rear axle, are from the M3/M4. So is the Active M Differential, a multi-plate, electronically controlled, limited-slip that can fully lock in just 150 milliseconds, preventing the inside rear wheel from spinning too eagerly in a corner. A special underbody stiffening plate helps handle all the forces caused by the differential. The tires are 19-inch Michelin Pilot Super Sports, 245/35 up front and 265/35 out back. Big M compound brakes with perforated-and-vented rotors measure 15 inches up front and 14.5 inches in the rear with 4-piston front and 2-piston rear calipers. Microsoft Surface Pro 5 Latest Rumors: Spring Release With AMD Ryzen And Windows 10 Creators Update?